You're receiving this email because you opted to receive newsletters from NorthWestPharmacy.com. Save Up to $15 at NorthWestPharmacy.com! In the next few days, all Health Perch subscribers will receive a special promotional code by email, as part of our exclusive promotion where you can save up to $15 on a future order! Please note that coupon codes are not automatically applied and must be provided at checkout. Account credits are applied five business days after the qualifying order has been shipped and may be used on any subsequent order. Minimum spend amounts do not include any shipping fees. Become a subscriber to our acclaimed digital health magazine, Health Perch, for free and take advantage of this and other great promotions! What’s Driving Prescription Drug Prices in the US? Did you know that 55 percent of Americans regularly take prescription drugs and those who use a prescription drug take four, on average? According to a recent Commonwealth Fund article, What's Driving Prescription Drug Prices in the US?,"[c]ost-related noncompliance is already a big issue in the U.S., with nearly 18 percent of adults reporting they skip medications as prescribed because of cost." The primary and secondary health issues which can be created by non-adherence to prescribed treatment, has the potential to place a huge financial burden on the healthcare system and American taxpayers. 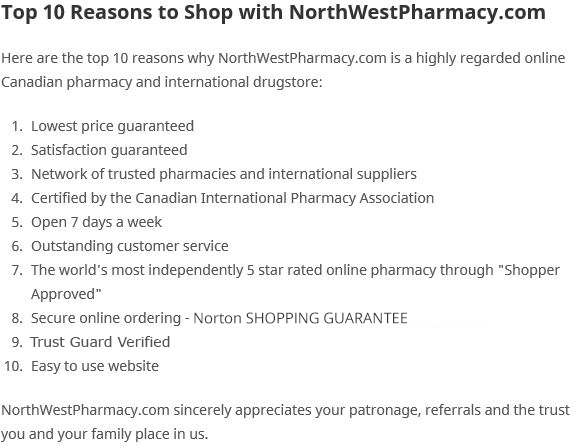 With NorthWestPharmacy.com, customers have a safe and viable option to the high drug prices in the U.S.
You can help to promote and protect your right to affordable medications through the Campaign for Personal Prescription Importation (CPPI). This national nonprofit patient advocacy organization fights for Americans’ access to safe, affordable prescription medications from Canada. The CPPI website provides valuable education and resources, as well as an opportunity for you to tell your story or sign up for their free and incredibly informative newsletter.